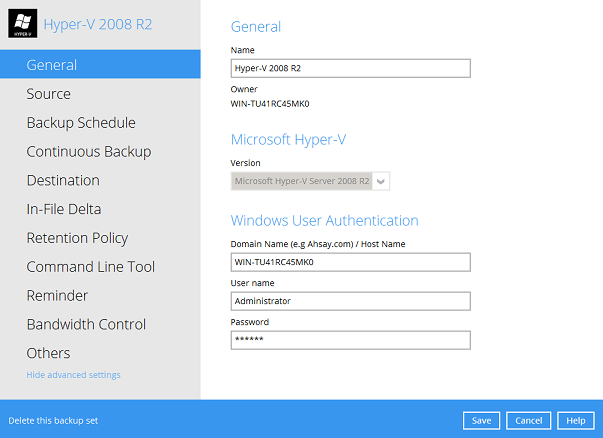 Retrospect Virtual Host Server is installed on the Hyper-V server. 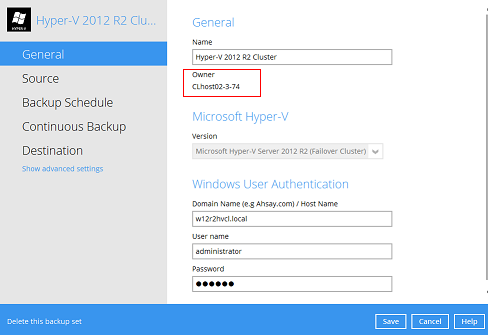 For Hyper-V Cluster environments Retrospect Virtual Host Server is installed on all Cluster nodes. The operating system account for setting up the Hyper-V / Hyper-V Cluster backup set must have administrator permission (e.g. administrative to access the cluster storage). Retrospect Virtual Host Server user account has sufficient quota assigned to accommodate the storage of the guest virtual machines. (Please contact your backup service provider for details). Using fixed Hard Disks it will back up the provisioned size, i.e. for a 500GB fixed virtual hard disk 500GB will be backed up to the storage designation. Using Dynamic Hard Disk or Differencing Hard Disk it will back up the used size, i.e. for a 500GB fixed virtual hard disk, 20GB will backed up to the storage designation if only 20GB are used. The default Java heap size setting on Retrospect Virtual Host Server is 768MB, for Hyper-V backups it is highly recommended to increase the Java heap size setting to improve backup and restore performance. (The actual heap size is dependent on amount of free memory available on your Hyper-V server). The temporary folder is used by Retrospect Virtual Host Server for storing backup set index files and any incremental or differential delta files generated during a backup job. To ensure optimal backup/restore performance, it is recommended that is located on a local drive with plenty of free disk space. 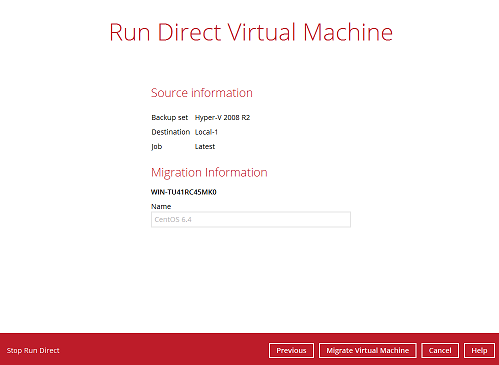 Retrospect Virtual Host Server UI must be running when a guest virtual machine is started using Run Direct Restore or when migration process is running. For local, mapped drive, or removable drive storage destinations with Run Direct enabled the compression type will always be set to No Compression and data encryption is disabled to ensure optimal backup and restore performance. 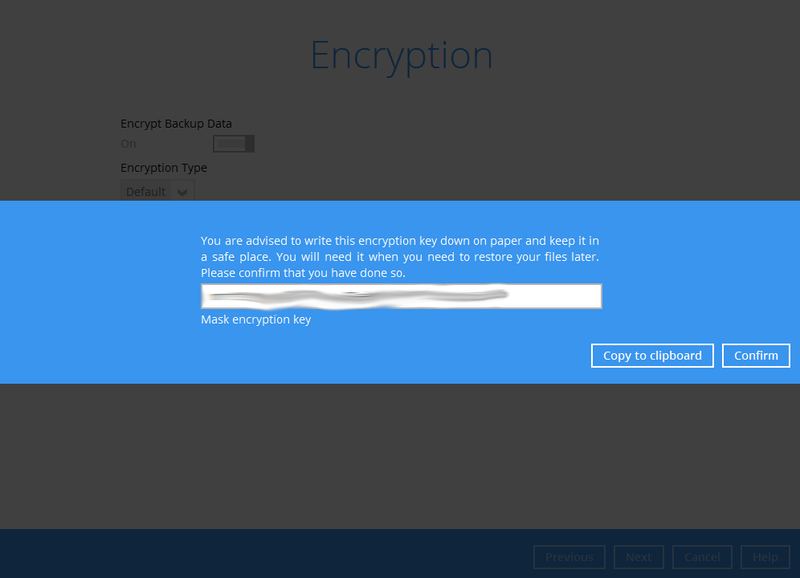 The backup set compression type and data encryption settings will only be applied to Retrospect Virtual Management Console, SFTP/FTP, or Cloud storage destinations. For ease of restore it is recommended to back up the whole guest machine (all the virtual disks) rather than individual virtual disks. 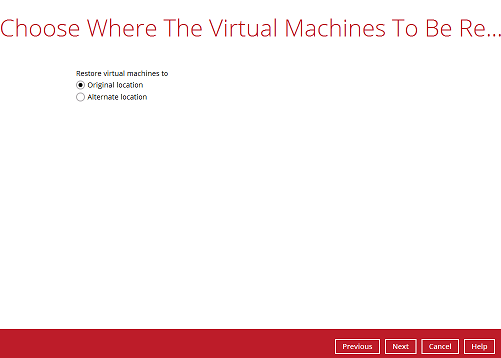 CBT Cluster Services (Retrospect Virtual Host Server) is installed and enabled upon installation. 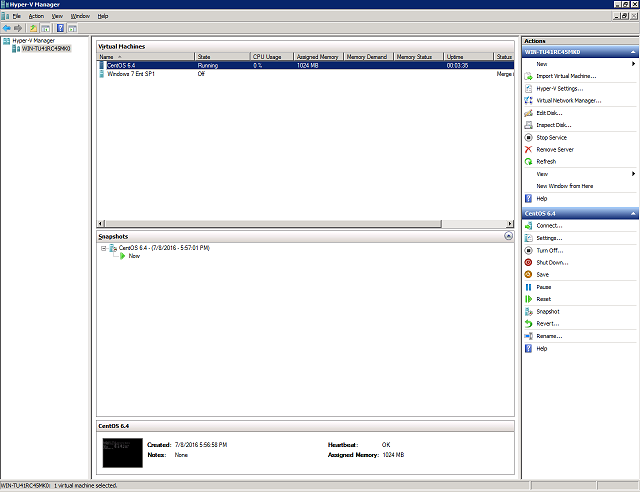 The Hyper-V management tools are installed on the server. For Hyper-V Cluster environments Hyper-V management tools is installed on all Cluster nodes. 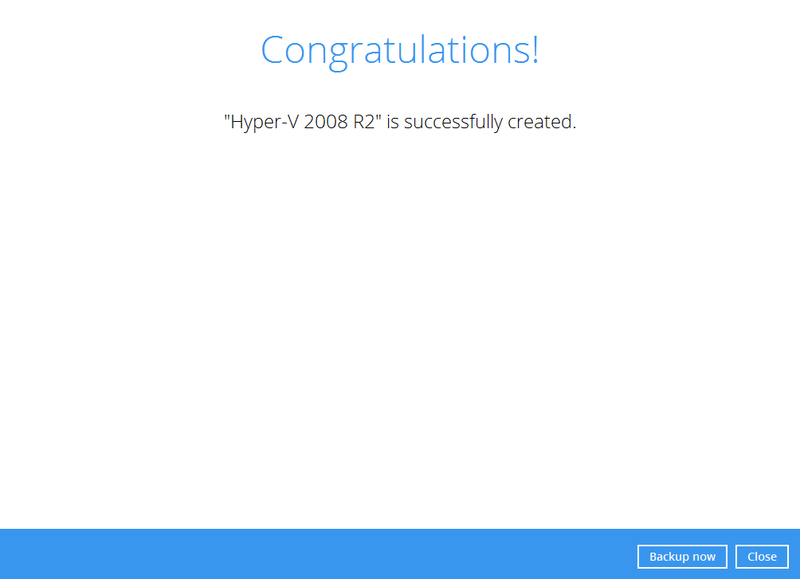 The Hyper-V services are started on the server. 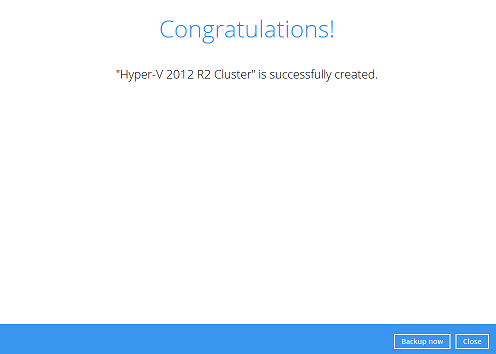 For Hyper-V Cluster environments the Hyper-V services are started on all Cluster nodes. The Microsoft Hyper-V VSS Writer is installed and running on the Hyper-V server and the writer state is Stable. This can be verified by running the vssadmin list writers command. System error 577 has occurred. Restart the affected server afterward for Retrospect Virtual Host Server to operate properly. 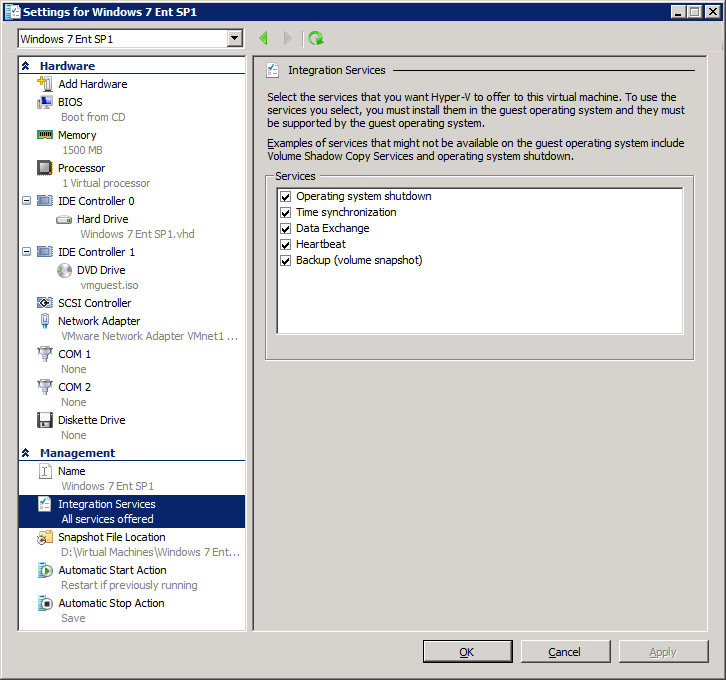 If Integration services is not installed / updated on a guest virtual machine or the guest operating system is not supported by Integration Services, the corresponding virtual machine will be paused or go into a saved stated during the snapshot process for both backup and restore, and resume when the snapshot is completed. Furthermore, the corresponding virtual machine uptime will also be reset to 00:00:00 in the Hyper-V Manager. Installing or updating Integration Services guest virtual machine(s) may require a restart of the guest virtual machine to complete the installation. If the guest operating system supports live virtual machine backup the Backup (volume checkpoint) is enabled. For Hyper-V 2008 R2 server in order to use Run Direct restore feature the "Microsoft Security Advisory 3033929" security update must be installed. 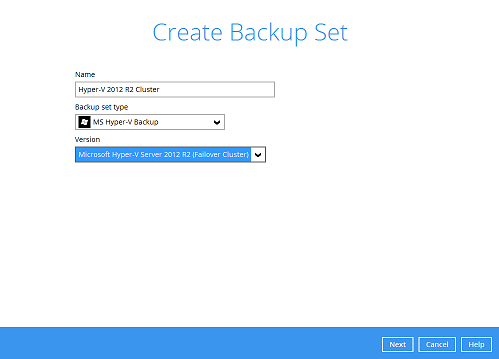 For Run Direct Hyper-V Cluster backup sets the storage destination must be accessible by all Hyper-V nodes. 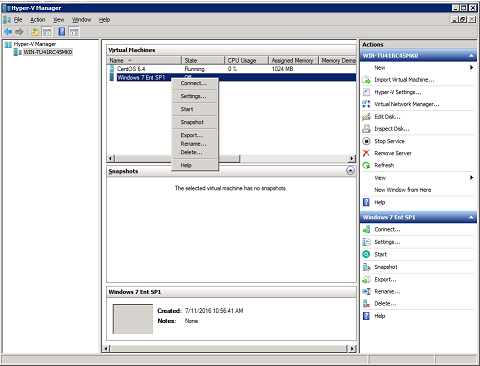 For Hyper-V Cluster backup sets the guest virtual machines must be created and managed by the Failover Cluster Manager. Backup of guest machines located on a SMB 3.0 shares are not supported. 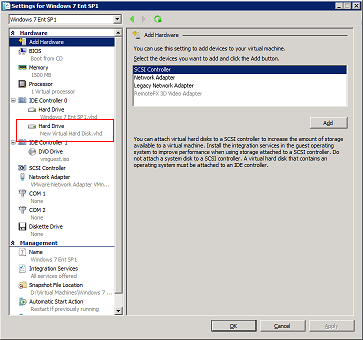 Backup of virtual machine with pass through disk (directly attached physical disk) is not supported. For backup of individual virtual disk, the restored virtual machine does not support the reversion of previous snapshots, if the snapshot contains disks which are not previously backed up by Retrospect Virtual Host Server. 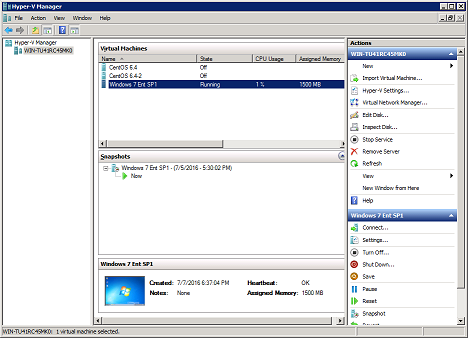 A guest virtual machine can only be restored to the original Hyper-V server or Hyper-V Cluster environment. 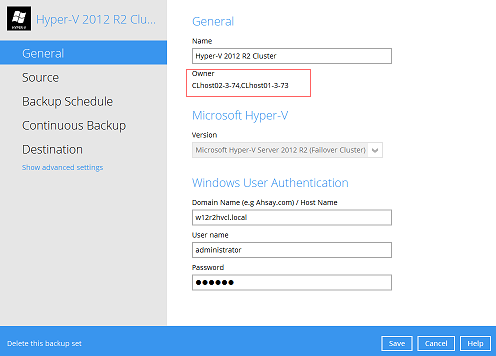 Restore to another Hyper-V server or Hyper-V Cluster environment is not supported. 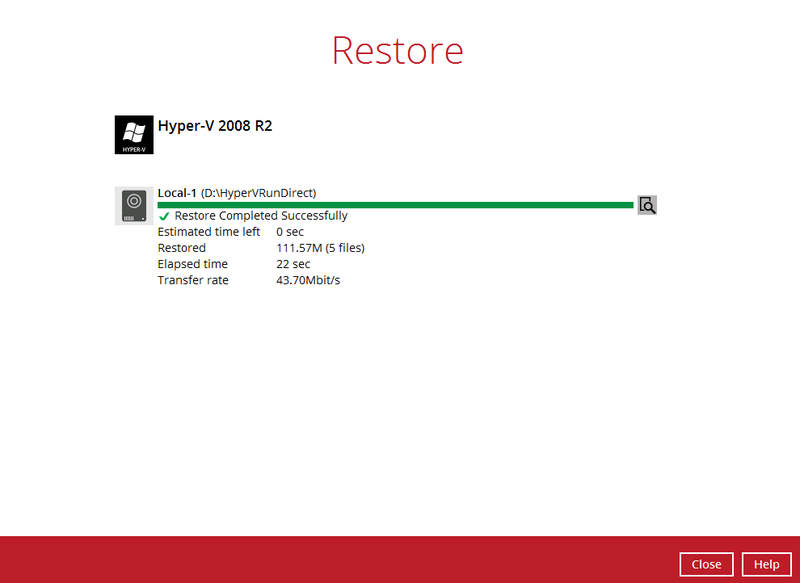 A guest virtual machine can only be restored to the Hyper-V server with the same version, i.e. 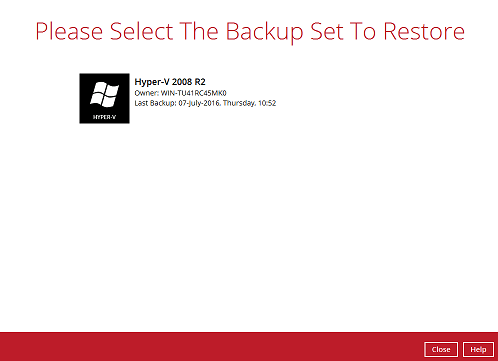 backup of a guest on Hyper-V 2012 R2 server cannot be restored to Hyper-V 2008 R2 Server or vice versa. The guest virtual machine will not start up if the virtual disk containing the guest operating system is not restored. Restore of individual virtual disks is only supported using the Restore raw file option for a virtual disk with no snapshots. Note: This will require modification of Hyper-V guest configuration files, and this only should be done if you have in-depth knowledge and understanding of Hyper-V, otherwise the guest virtual machine may not startup properly. Restore to an Alternate location you can only be performed on one guest virtual machine at a time. Restored guest virtual machines using Run Direct containing a saved state will not automatically power on. The saved state must be manually deleted in Hyper-V Manager and the guest must be powered on manually. For Run Direct enabled backup sets the storage destination is restricted to Local, Mapped Drive, or Removable Drive. When a guest virtual machine is started in a Run Direct instance is stopped any changes made within the guest environment will be lost, if the guest virtual is not migrated to the Hyper-V Server using the “Auto migrate after Run Direct is running” option. When a guest virtual machine is started using Run Direct Restore all backup jobs (manual, scheduled, and continuous) for the related backup set will be skipped. When a guest virtual machine is started using Run Direct Restore the following features are not available for the backup set; Data Integrity Check, Space Freeing Up, and Delete Backup Data. 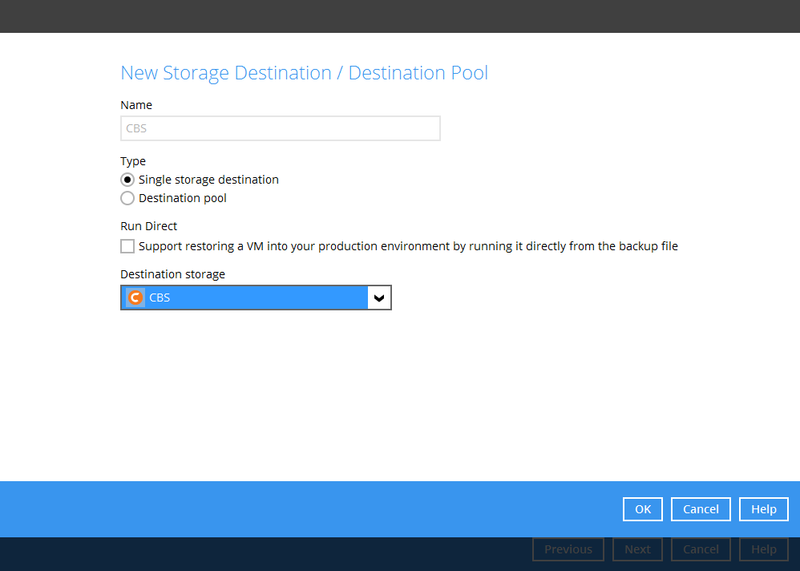 The CBT feature only supports Run Direct enabled storage destinations. The storage destinations are restricted to Local drives, mapped drives, or removable Drives. 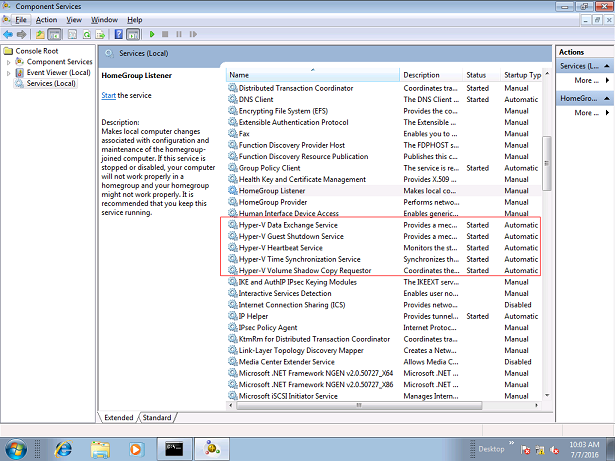 CBT cluster service is only applicable to Windows x64 installation. 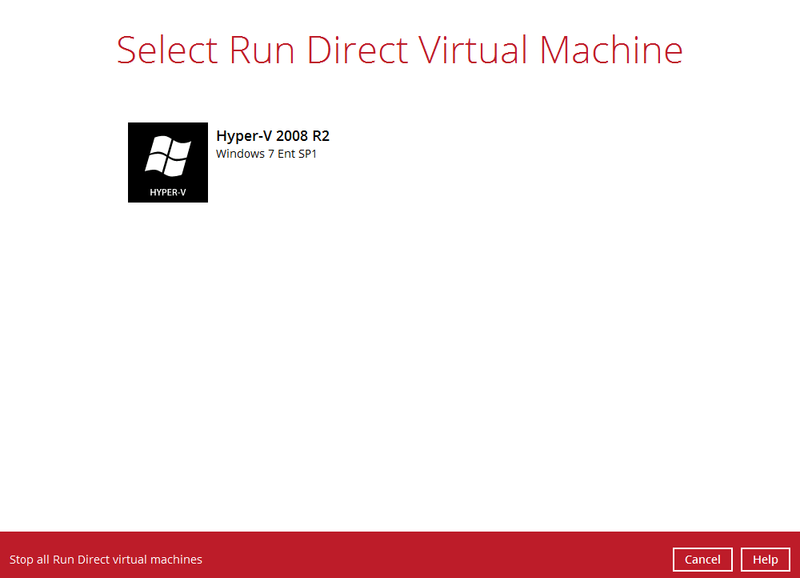 Hyper-V Run Direct is a feature that helps to reduce disruption and downtime of your production guest virtual machines. 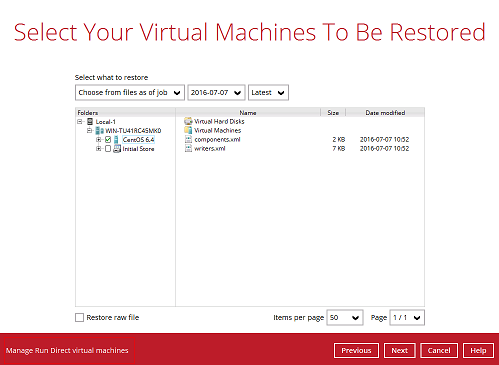 Unlike normal recovery procedures where the guest virtual machine(s) are restored from the backup destination and copied to production storage, which can take hours to complete. 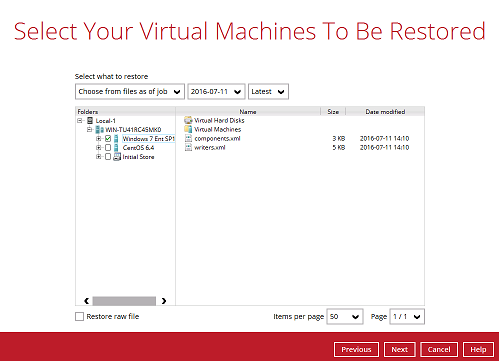 Restore with Run Direct can instantly restore a guest virtual machine by running it directly from the backup file in the backup destination; this process can be completed in minutes. Administrators can then troubleshoot on the failed guest virtual machine, while users are back in production with minimal disruption. Delete Guest Virtual Machine: Retrospect Virtual Host Server will delete the existing guest virtual machine on the original or alternate location (if applicable). Create Virtual Hard Disk Image Files: Empty virtual hard disk image files are created on the Hyper-V server (either on the original location or alternate location). Create VSS Snapshot: A VSS snapshot is created to make the backup data read only and track changes made within the guest virtual machine environment. Start Up Virtual Machine: The guest virtual machine is started up. To finalize recovery of the guest virtual machine, you will still need to migrate it to from the backup destination to the designated permanent location on the Hyper-V server. Copy Data: Copy the data from the backup files in the backup destination to empty hard disk images on the Hyper-V server. Apply Changes: Apply any changes made within the guest virtual machine environment to the hard disk image files on the Hyper-V server. Delete VSS Snapshot: The VSS snapshot will be deleted after the Run Direct restoration is completed. The restored virtual machine, at this stage (e.g. before the restore is finalized) is in a read-only state to avoid unexpected changes. All changes made to the virtual disks (e.g. 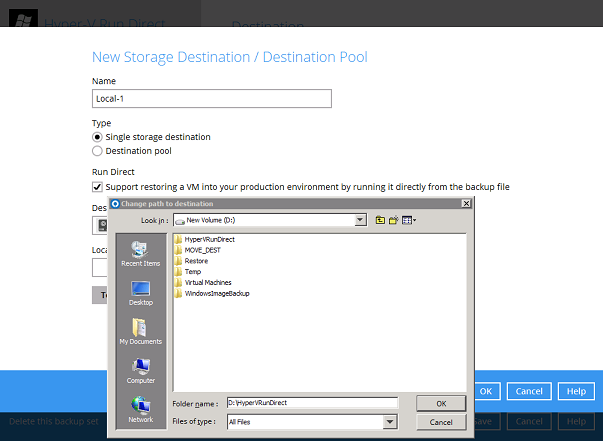 operation within the guest virtual machine) are stored in a VSS snapshot created for the Run Direct restore. These changes are discarded when Run Direct is stopped, where the restored guest virtual machine will be removed and all changes will be discarded, or the changes will be consolidated with the original virtual machine data when the restore is finalized. Granular restore is one of the available restore options for Hyper-V backup sets from Retrospect Virtual Host Server. 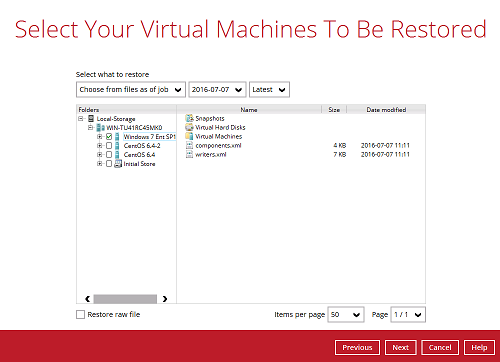 Retrospect Virtual Host Server makes use of granular restore technology to enable a file level restore from a virtual disk file (VHD) of guest VM backup possible. It is particularly useful if you only need to restore individual file(s) from a guest VM which would normally take a long time to restore and then startup before you can gain access the files on the virtual disks. 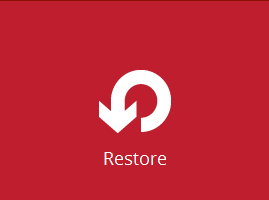 Granular restore gives you a fast and convenient way to recover individual files from a guest VM. 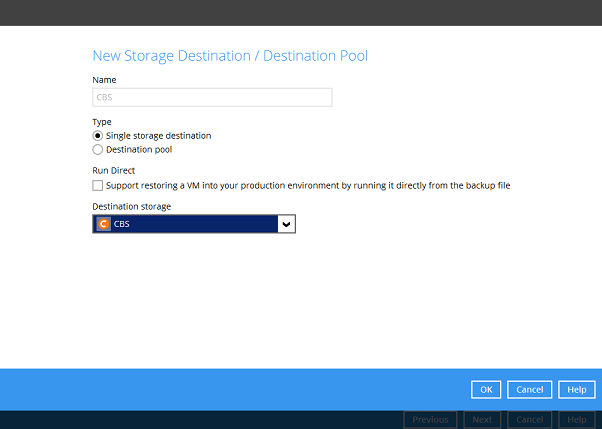 During the granular restore process, the virtual disks of the guest VM can be mounted on the Hyper-V host or on another Windows machine as a local drive. This will allow the individual files on the virtual disks to be viewed via the file explorer within Retrospect Virtual Host Server or from the Windows File Explorer on the Windows machine you are performing the restore on, without having to restore the entire virtual machine. Granular restore can only mount virtual disks if the guest VM is running on a Windows Platform. The mounting of Linux/Unix file systems from virtual disk file is currently not available due to limitations of the file system drivers. 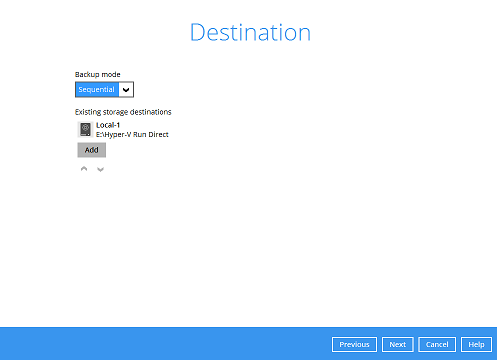 It is supported for all backup destinations, i.e. 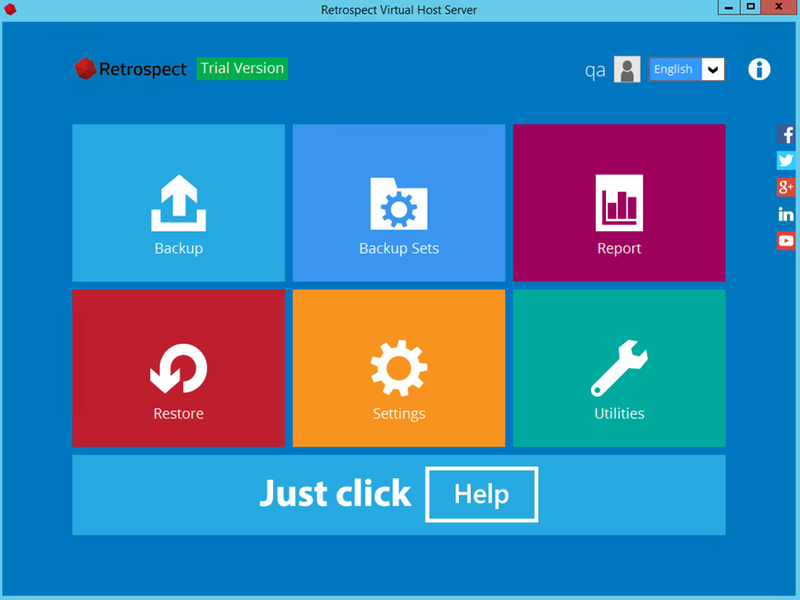 Retrospect Virtual Management Console, Cloud storage, or Local/Network drives. 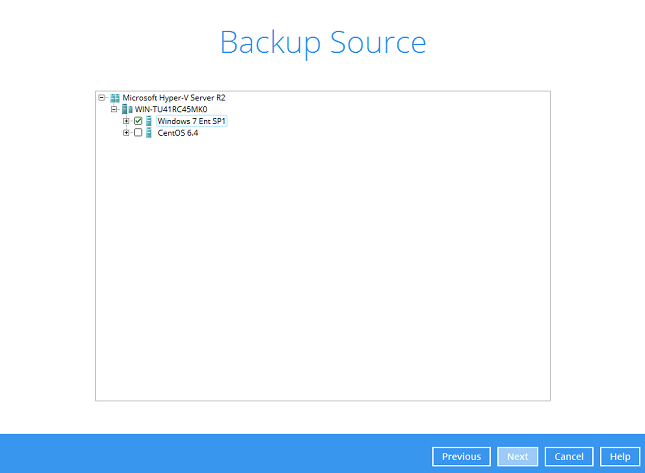 Only One Backup Set Required: With traditional restore methods, if you wish to restore individual file(s) from a guest VM, you will have to create two different backup sets; a Hyper-V guest VM backup set and a separate file backup set for the file(s) you wish to restore. You will required an additional Retrospect Virtual Host Server installation on the guest VM environment, with Granular Restore feature, only one backup set is required. Granular restore is supported on Hyper-V backup sets created and backed up using Retrospect Virtual Host Server installed on a Windows platform with the Granular Restore feature enabled on each backup set. A shortcut icon of Retrospect Virtual Host Server should have been created on your Windows desktop after installation. Double click the icon to launch the application. Enter the login name and password of your Retrospect Virtual Host Server account provided by your backup service provider, then click OK to login. 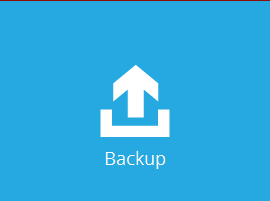 Create a new backup set by clicking the “+” icon or Add button to created new backup set. 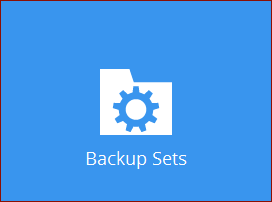 Select the Backup set type and name your new backup set then click Next to proceed. In the Backup Source menu, select the guest virtual machines you would like to backup. Click Next to proceed. 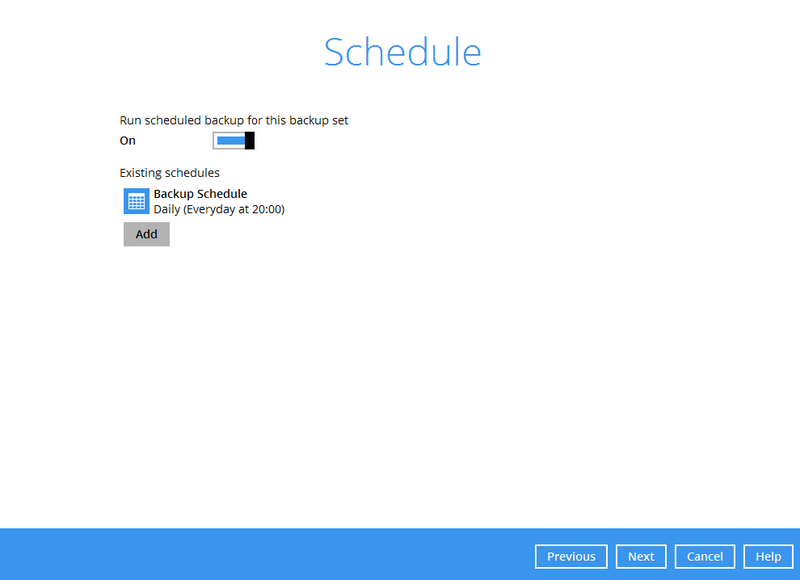 In the Schedule menu, you can configure a backup schedule for backup job to run automatically at your specified time interval. Click Add to add a new schedule or double click on the existing schedule to change the values. Click Next to proceed when you are done setting. 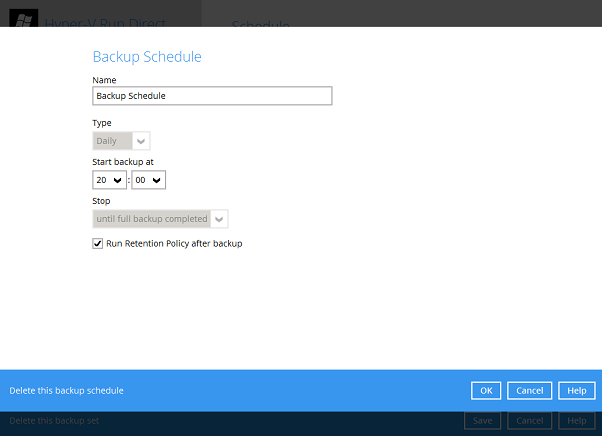 Note: The default backup schedule is daily backup at 22:00 with the backup job will run until completion and the retention policy job will be run immediately after the backup job. 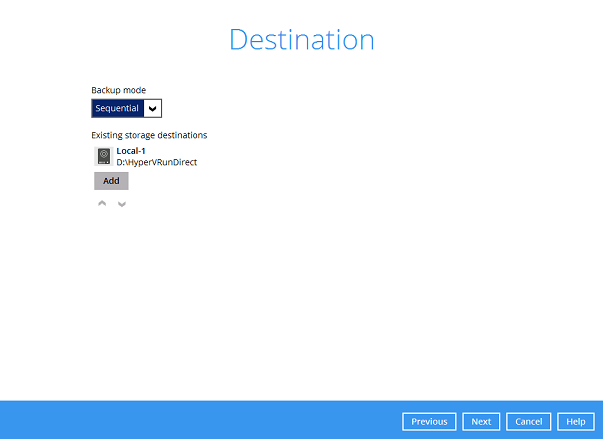 Select the backup storage destination. Note: For Hyper-V backup sets by the default the Run Direct feature is enabled. 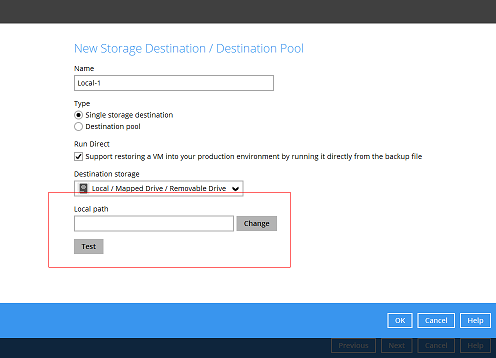 Click on Change to select the storage destination a Local, Mapped Drive, or Removable Drive. 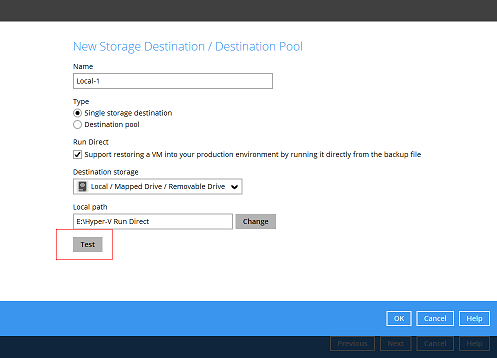 After selecting the storage destination click on the Test button to verify if Retrospect Virtual Host Server has permission to access the folder on the storage destination. Once the test is finished Retrospect Virtual Host Server will display “Test completed successfully” message. Click OK to proceed. 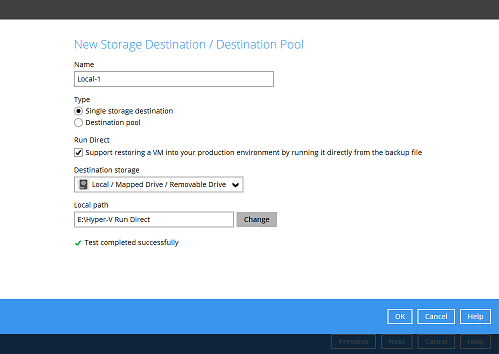 To add extra storage destination click Add, otherwise Click Next to proceed. 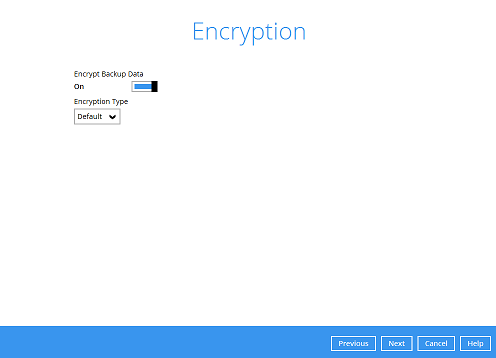 By default, the Encrypt Backup Data option is enabled with an encryption key preset by the system which provides the most secure encryption method (256 bit AES with a randomly generated 44 character alphnumeric encryption key). Click Next when you are done with the setting. 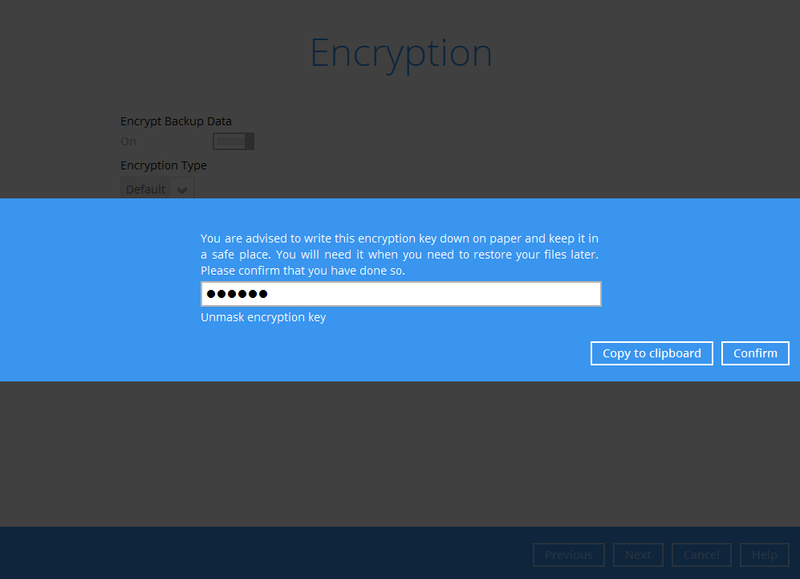 You can also change the Encryption Type to Custom to set your own encryption key, key length, algorithm and method. For local, mapped drive, or removable drive storage destinations with Run Direct enabled the compression type will always be set No Compression and data encryption is disabled to ensure optimal backup and restore performance. The backup set compression type and data encryption settings will only be applied to Management Console, SFTP/FTP, or Cloud storage destinations for the backup set. 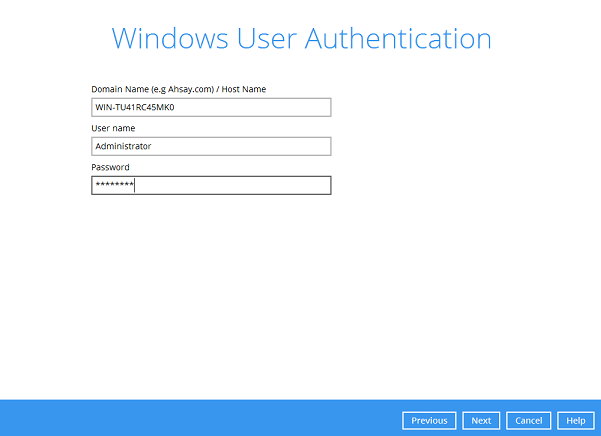 Enter the Windows login credentials used by Retrospect Virtual Host Server to authenticate the scheduled or continuous backup job. Note: If the backup schedule is turned off for the backup set the Windows User Authentication screen will be automatically skipped. 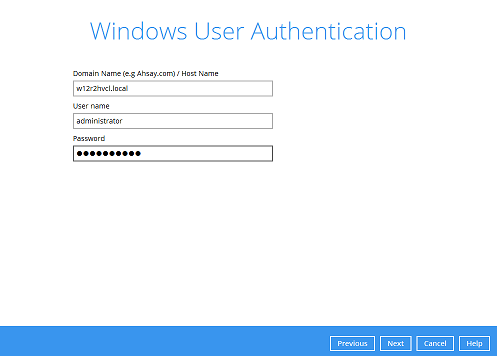 The Windows User Authentication login credentials can be added or update post backup set creation. 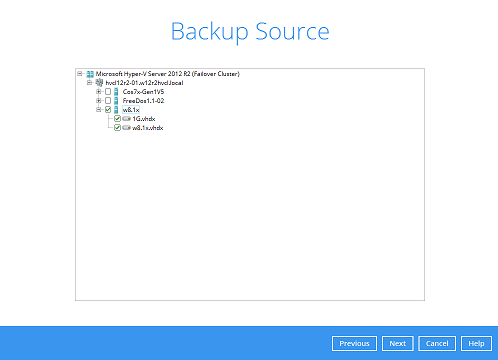 To start a manual backup job click on Backup now. 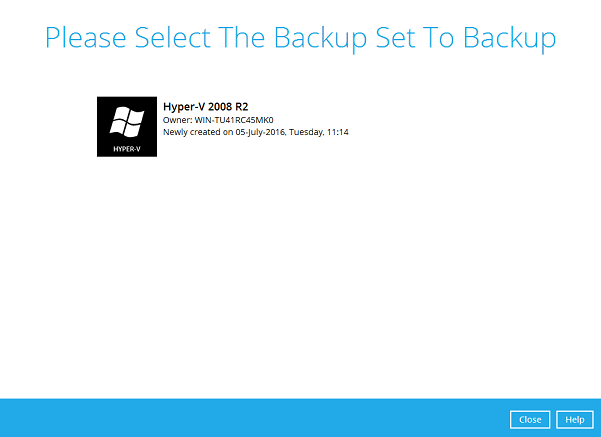 To verify the backup set settings click on Close and then click on the Hyper-V backup set to complete the setup. + Note: Retrospect Virtual Host Server will automatically detect the Hyper-V version installed on the host. 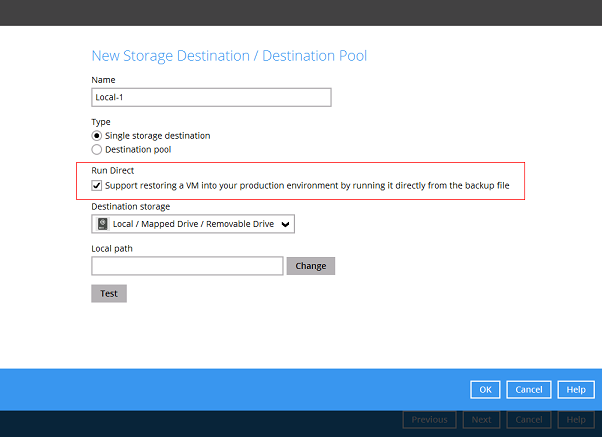 Note: For Hyper-V backup sets, the default setting is for Run Direct to be enabled and the storage destination is either a Local, Mapped Drive, or Removable Drive. To select a cloud, sftp/ftp, or Management Console as a storage destination un-select Run Direct setting and select your desired cloud, sftp/ftp, or Management Console as a storage destination. Click OK to proceed when you are done. Click Add to an additional storage destination or click Next to proceed when you are done. Note: To utilize the CBT feature, the storage destination must be a Local, Mapped Drive, or Removable Drive. Enter the Windows login credentials used by Retrospect Virtual Host Server to authenticate the scheduled backup job. The same version of Retrospect Virtual Host Server must be installed on all Hyper-V Cluster nodes. The same backup user account must be used. 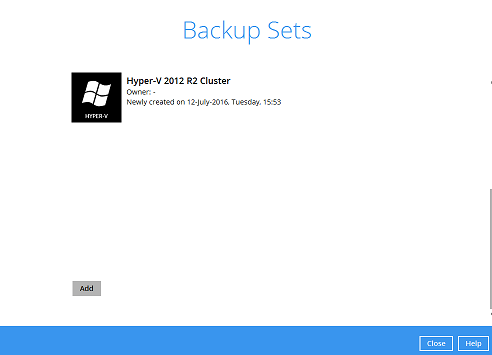 The backup schedule must be enabled on all Hyper-V Cluster nodes. 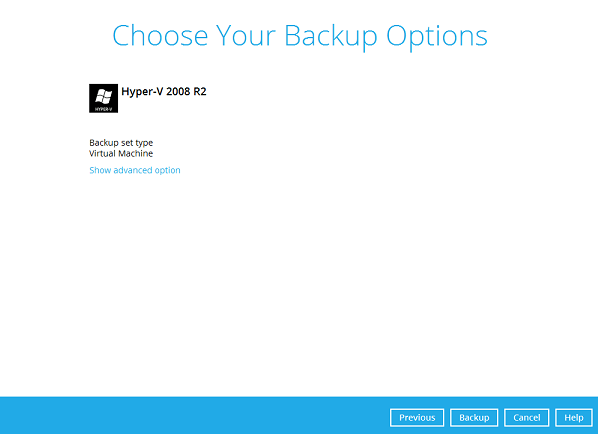 Select the Backup set type MS Hyper-V Backup, Version Microsoft Hyper-V Server 2012 R2 (Failover Cluster), and name your new backup set then click Next to proceed. Note: For Hyper-V Cluster backup set with Run Direct enabled please ensure all nodes have access to the Local, Mapped Drive, or Removable Drive destination storage. To add extra storage destinations click Add, otherwise Click Next to proceed. Go to General and verify if the node has been added to the backup schedule. 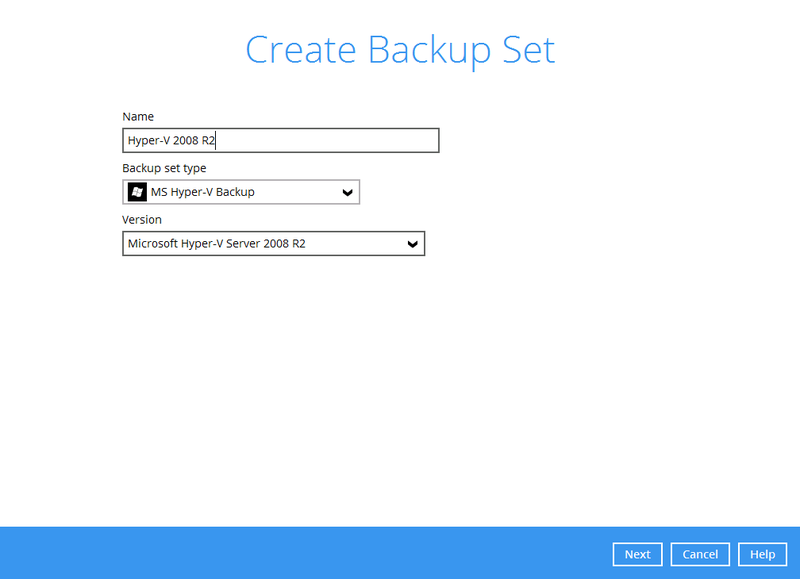 On the next Hyper-V node startup Retrospect Virtual Host Server and select the Hyper-V backup set. 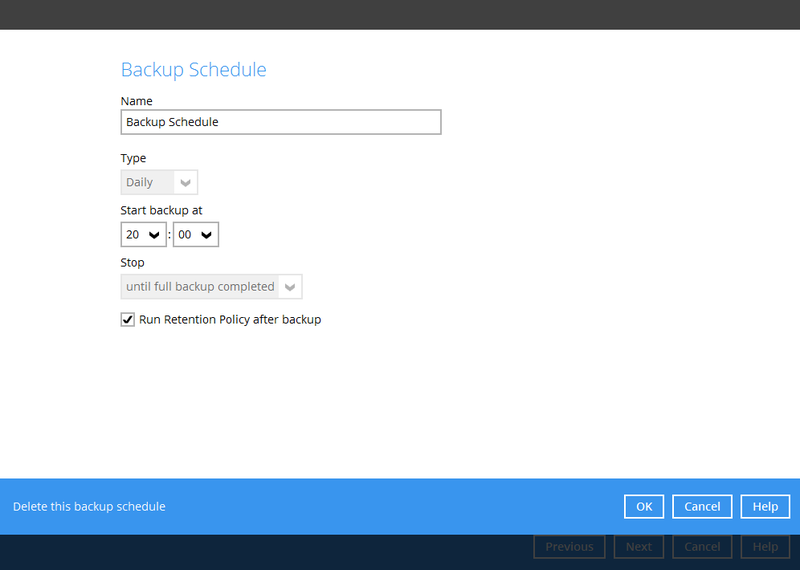 Go to Backup schedule and enable the Run schedule backup for this backup set and set the backup schedule time and click on Save when finished. Repeat steps 11 to 12 for all Hyper-V Cluster nodes. 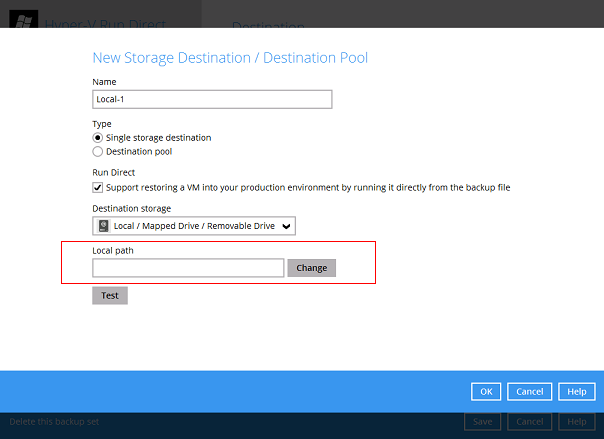 Note: For Hyper-V backup sets, the default setting is for Run Direct to be enabled and the storage destination is a Local, Mapped Drive, or Removable Drive. To select a cloud, sftp/ftp, or Management Console as a storage destination un-select *Run Direct* setting and select your desired cloud, sftp/ftp, or Management Console as a storage destination. Click OK to proceed when you are done. Repeat steps 13 to 15 for all Hyper-V Cluster nodes. 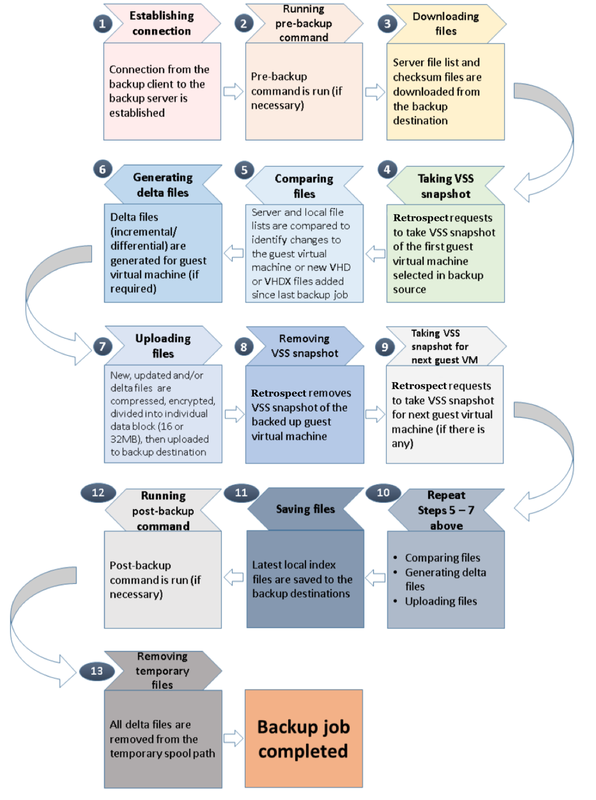 The following steps are performed during a Hyper-V VM backup job. 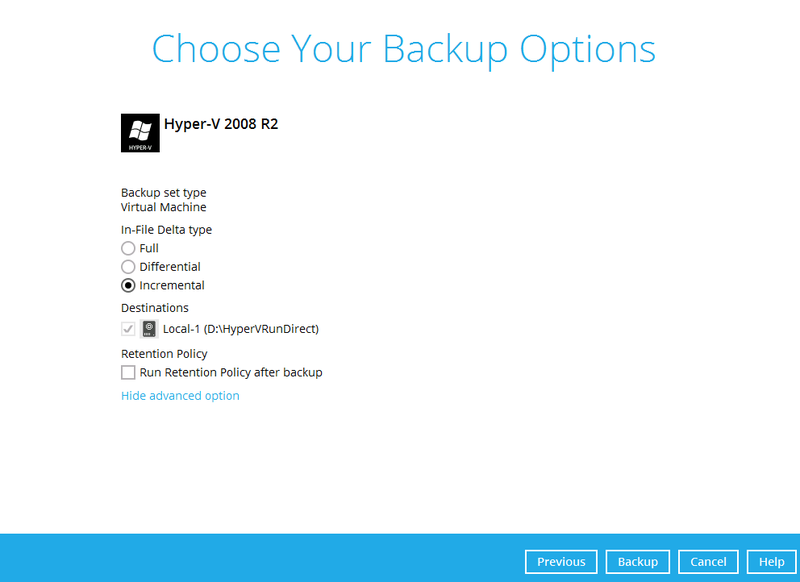 Select the Hyper-V backup set which you would like to start a manual backup. Click on Backup to start the backup job. If you would like to modify the In-File Delta type, Destinations, or Run Retention Policy Settings, click on Show advanced option. 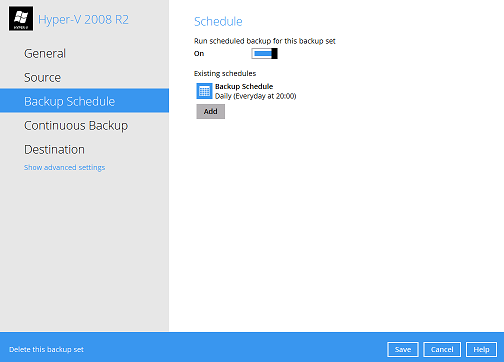 Click on the Backup Sets icon on the Retrospect Virtual Host Server main interface. 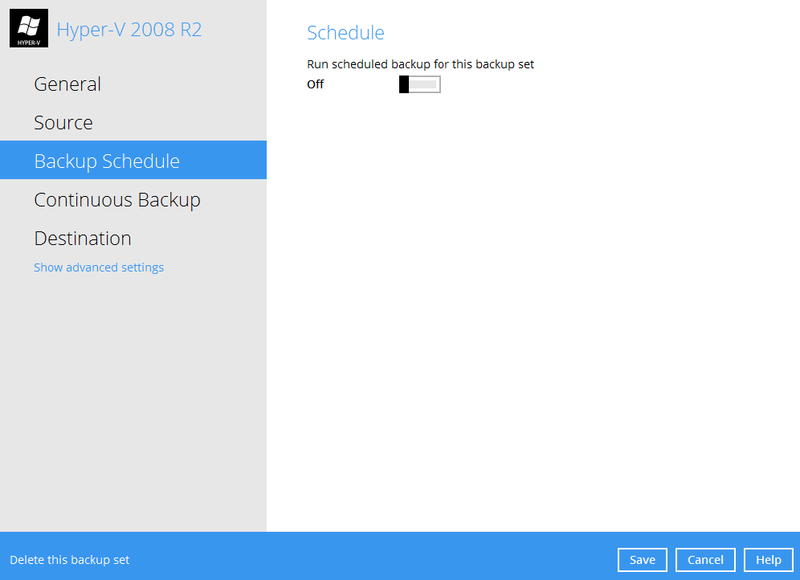 Select the backup set that you would like to create a backup schedule for. Then create a new backup schedule by clicking on the Run scheduled backup for this backup set. Set this to On. Click Add to add a new schedule or double click on the existing schedule to change the existing values. Click Save to proceed when you are done setting. Original location – Retrospect Virtual Host Server will restore the guest to the original location if the original guest virtual machine still exist Retrospect Virtual Host Server will prompt for confirmation to delete it before commencing with the restore operations. 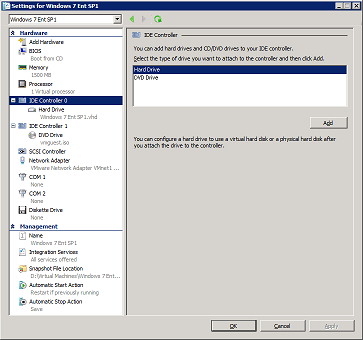 Alternate location – another drive or folder on the original Hyper-V server. 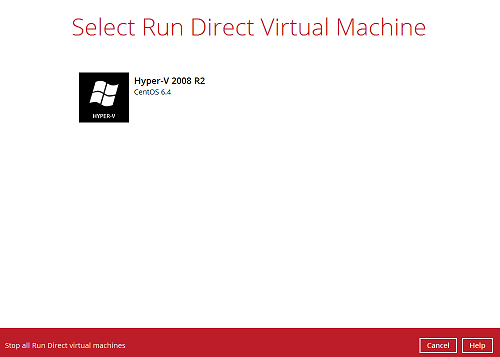 Select Run Direct – to start up the guest virtual machine directly from the backup file without restoring the guest virtual machine to the Hyper-V server. Note: If a guest machine is started in a Run Direct instance is stopped without migrating to the Hyper-V Server any changes made within the guest environment will be lost. Select both Run Direct & Auto migrate after Run Direct is running - to start up the guest virtual machine directly from the backup file and then start restoring the guest virtual machine files to the Hyper-V server. 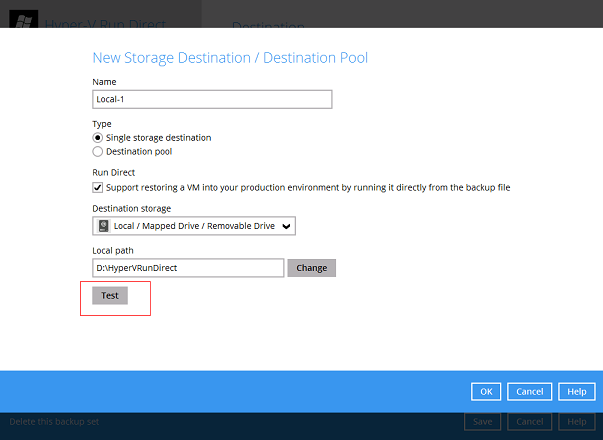 Run Direct is not selected – Retrospect Virtual Host Server will restore the guest virtual machine files to the Hyper-V server (same as non Run Direct restore). 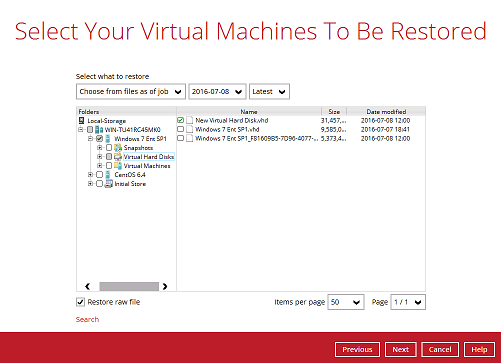 Select the backup set that you would like to restore the guest virtual machine from. Select the local, mapped drive, or removable drive storage destination that contains Hyper-V guest virtual machine that you would like to restore. Select to restore the Hyper-V guest from a specific backup job then select the files or folders that you would like to restore. Click Next to proceed. Select to restore the Hyper-v guest to the Original location and then select Run Direct click Next to proceed. 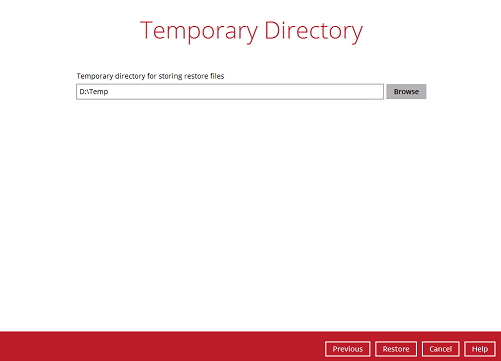 Confirm the temporary directory path is correct and then click Restore to proceed. If the guest virtual machine selected to be restore already exists on the Hyper-V server Retrospect Virtual Host Server will prompt to confirm overwriting of the existing guest. 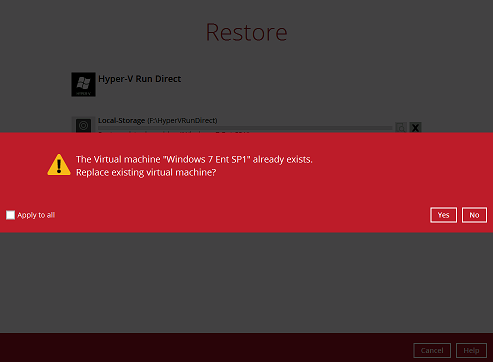 Yes - the exiting guest virtual machine will be deleted from the Hyper-V server before the restore process starts. No – the restore of the current guest virtual machine will be skipped. After the Hyper-V guest virtual machine has been restored. 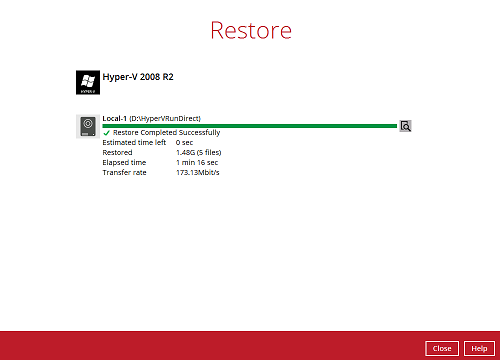 Go to the Hyper-V server and open the Hyper-V Manager to verify the guest has been restored and is powered on. Connect to the guest virtual machine to verify if is running correctly. Quitting Retrospect Virtual Host Server. Click on Stop Run Direct. Under [Restore]>[%BackupSetName%]. 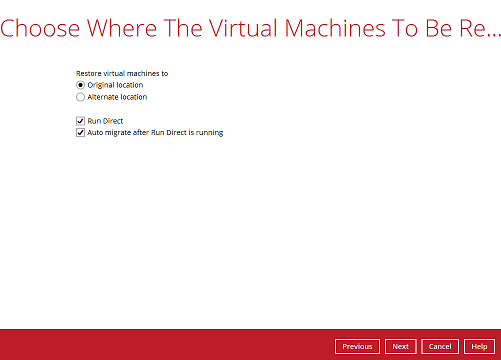 Click on **Stop all Run Direct virtual machines. Note: When a guest virtual machine is started in a Run Direct instance is stopped any changes made within the guest environment will be lost, if the guest virtual is not migrated to the Hyper-V Server using the “Auto migrate after Run Direct is running” option. 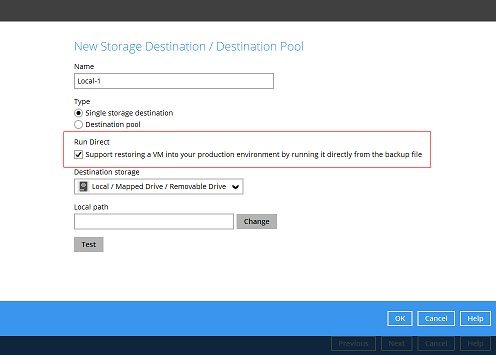 To permanently restore the guest virtual machine after starting up using the Run Direct option, you will still need to migrate it to from the backup destination to the designated permanent location on the Hyper-V server using the Migrate Virtual Machine option. This process can be performed even when the guest machine is already running. After starting up the guest machine from the backup destination. Click on Close. 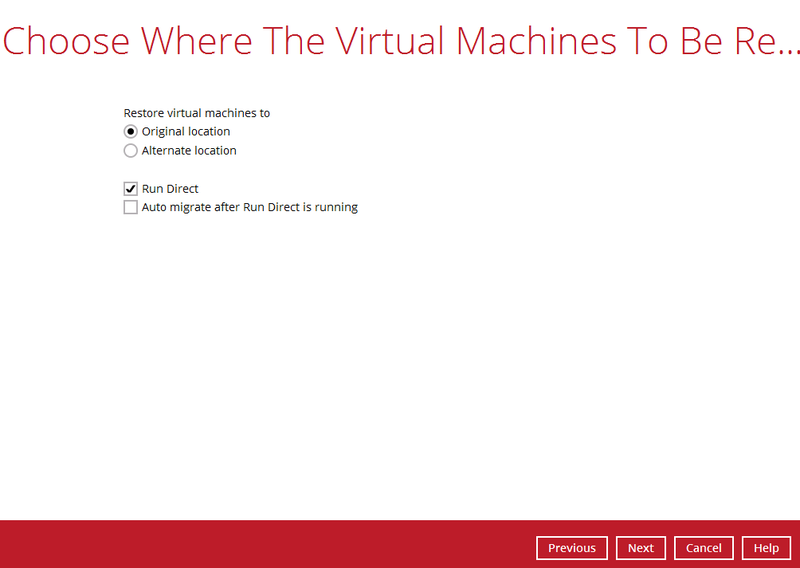 Click on Manage Run Direct virtual machines. 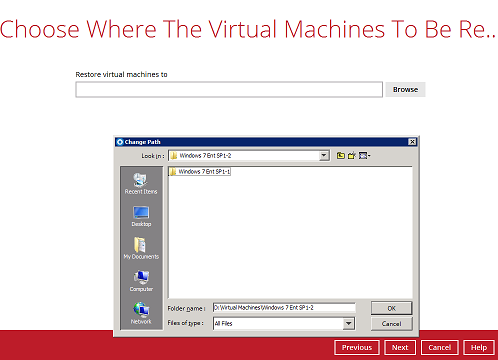 Click on the guest virtual machine. 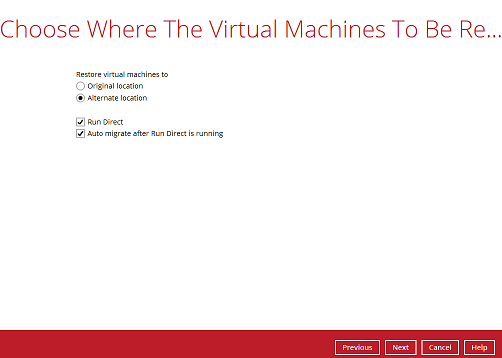 To permanently restore the guest virtual machine, click on **Migrate Virtual Machine. 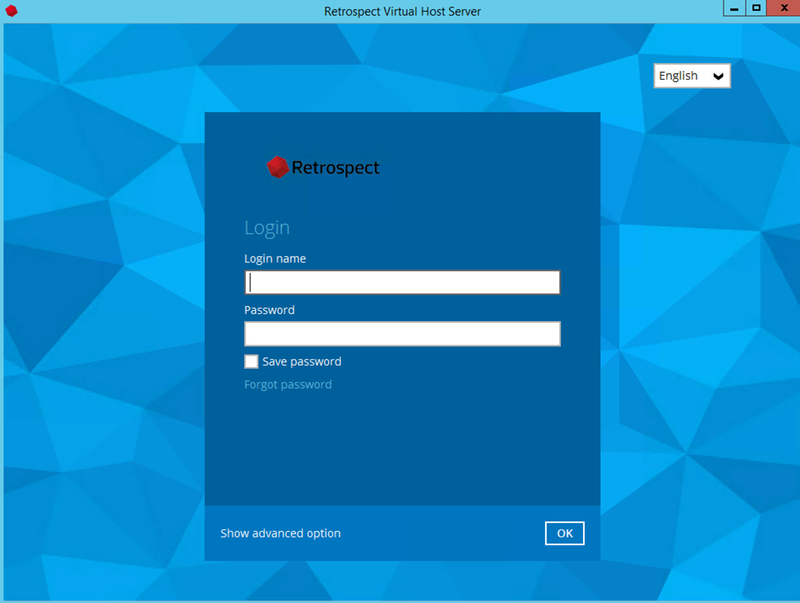 Retrospect Virtual Host Server will begin migration of the guest virtual machine from the backup destination to the Hyper-V Server. 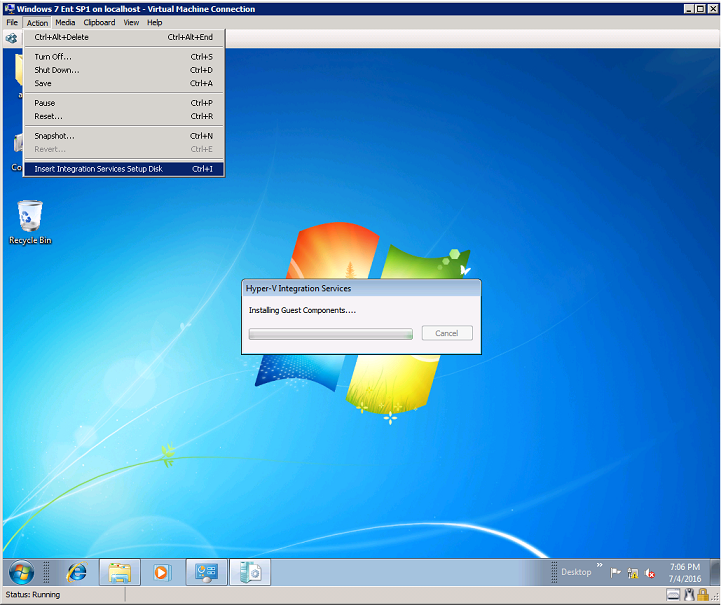 The guest virtual machine can be used during the migration process. Any changes made in the guest virtual machine environment are saved in transaction logs and will be applied when the migration process is completed. Select to restore the Hyper-V guest to the Original location, or to an Alternate location, then select Run Direct and or Auto migrate after Run Direct is running, click Next to proceed. Select the drive storage destination that contains Hyper-V guest virtual machine that you would like to restore. Select the Management Console, cloud, SFTP/FTP storage destination that contains Hyper-V guest virtual machine that you would like to restore. Select to restore the Hyper-v guest to the Original location, or to an Alternate location, then click Next to proceed. If the guest virtual machine selected to be restored already exists on the Hyper-V server Retrospect Virtual Host Server will prompt to confirm overwriting of the existing guest. Go to the Hyper-V server and open the Hyper-V Manager to verify the guest has been restored and power on the guest virtual machine. The Restore raw file feature is used to the restore of an individual virtual disk to the original or a different guest virtual machine. Select to restore the Hyper-V guest from a specific backup job then select the files or folders that you would like to restore. Then select the Restore raw file option and under the Virtual Hard Disks folder select the virtual disk you would like to restore. Click Next to proceed. 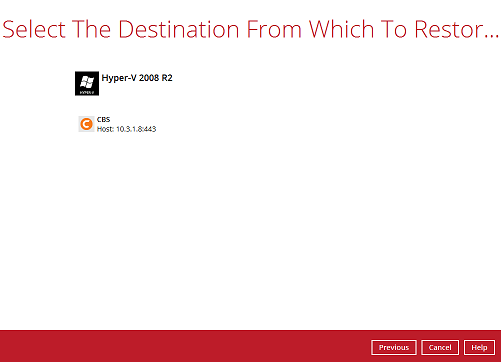 Select to location on the Hyper-V server you want to restore the virtual disk to. Click Next to proceed. 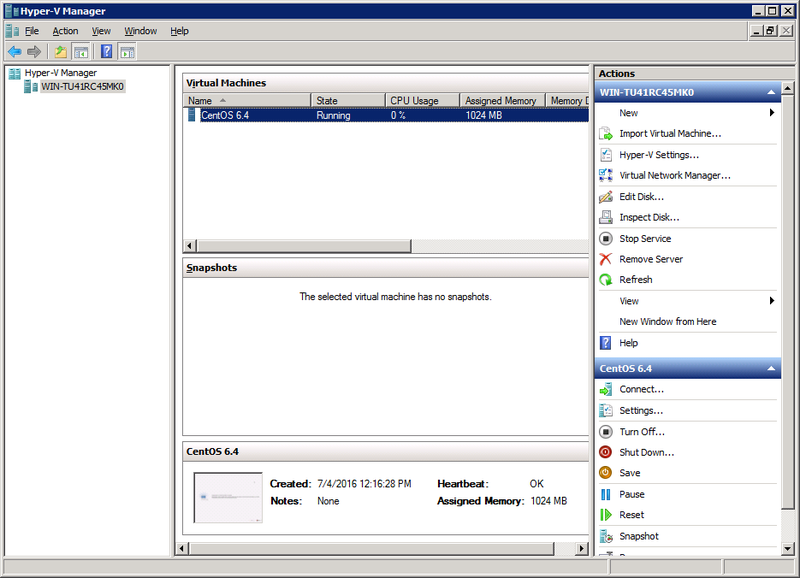 In Hyper-V Manager and right click on the guest virtual machine you wish to add the virtual disk to and select Settings. 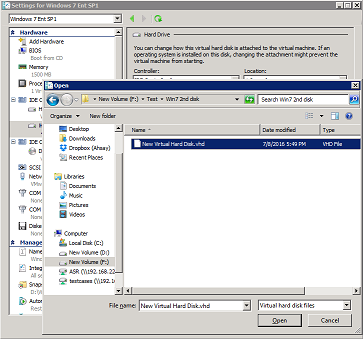 Select Add to add virtual disk to the guest virtual machine. Select the folder where the restore virtual disk is located. Start the guest virtual machine to confirm. Depending on the guest operating system there may be other configuration settings to be completed before the disk is available. 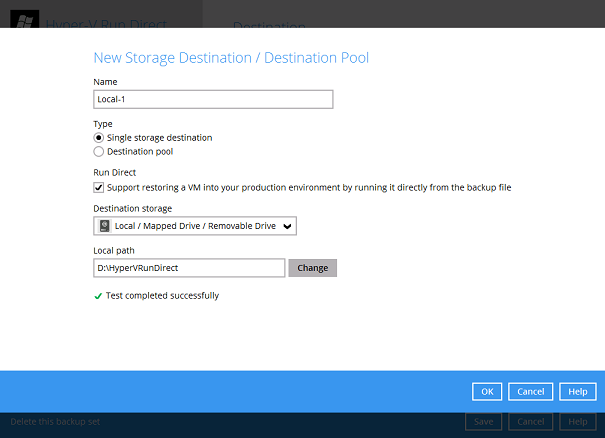 The restore to Alternate location is available for both Run Direct and Non-Run Direct backup sets, this feature will restore any guest virtual machine to another location on the same Hyper-V server. 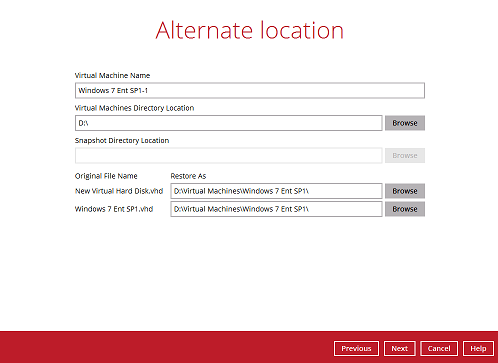 The Restore to Alternate location can be used to restore only one guest virtual machine at any one time. Select Alternate location and click Next to proceed. 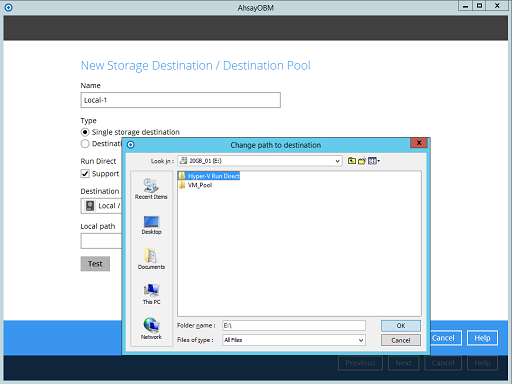 Example: Restore a guest from using Run Direct with Auto Migration to another location. When the values have been updated click on Next to proceed. After the Hyper-V guest virtual machine has been restored successfully. Open Windows File Explorer and verify the guest has been restored to the new location.